Every king, civilization, and country has its own era in which it was influential, progressive and revered. This same theory applies to sports and games of every era. Chess is no different in this aspect from any other game. Every era has its own style, its own masters and geniuses. Comparing one era or master from one era to another is foolishness. But, sometimes the boundary between one era in which a particular style is prevalent, and another, in which some other style is prevalent, becomes quite blurred. Although, the aforementioned fact often stands its ground, there are some exceptions. The biggest exception to this fact is the unique style of game play of the Romantic Era of chess. The Romantic Era of arts flourished in the 19th century. It roughly coincided with the styles of game play which were later collectively called Romantic chess. Romantic chess exhibited a completely different style from the modern form. It was more concerned with the exhibition of the art of winning with style. Whereas, in the modern form of game play, the masters are more concerned with winning. Whether that is obtained by playing defensively or by playing aggressively does not matter. The masters of the Romantic Era were more concerned with impressing the audience and defensive game play was considered unsportsmanlike. The Romantic Era's masters favored the King's Gambit Accepted and the Evans Gambit Accepted the most. The era was known for some of the greatest chess players ever, like Adolf Anderssen, Henry Blackburne, Mikhail Chigorin, Frank Marshall, Paul Morphy and William Steinitz. Here, I am presenting a game from that era, played by the genius chess player Rudolf Charousek, against Jakob Wollner. White goes for the Danish Gambit. Black accepts winning two pawns. Black threatens the e-pawn. He must open up and start developing his pieces. Building pressure on the weak square of f2. White seems to be trying to control the center square e5. White takes the Black pawn on c3 and protects the b-pawn. White threatens pawn at f7. But, why would anyone sacrifice a Knight for a mere pawn? Why would Charousek choose such a silly move? 8.Bg5 would have pinned the Black Knight to the Black Queen. means White should either move his Knight or risk losing it. Taking the f-pawn and threatening the queen. There is a discovered attack on the Black King from the White Bishop on c4. Black takes the White Knight and leaves his Rook pinned to the King. Threatening the Black pawn on d6. It must be noted that the d6 pawn is pinned to the Black Queen on d8 (shielding her from the White Queen on d1). So, Black cannot take the White pawn without losing his Queen. Black threatens f2 twice, firstly from the Bishop at c5 and secondly from the Knight at g4. Threatening the Black Rook on f7. Seems like the Queen is running for cover! Or is she? Is a planned checkmate is in motion (Qh2#)? Takes the Black Rook with check. Black blocks the advancing pawn with his King. White stops the threat of Qxh2#. Black takes f2 with the Knight, making a double attack possible. 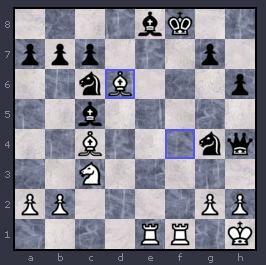 The White Queen is threatened by the Black Knight on f2, and the White Bishop is threatened by the Black Queen on h4. Also, a discovered check on the White King is possible. White moves his Queen to safety. Revealing the discovered check on the White King from the Bishop on c5. White moves his King out of the way of the incoming attack. Negating the chances of a check to his King. The Bishop now covers e8, hence, White can't go for Qe8#. White builds a battery out of his Rook and Queen. Giving the a8 Rook a clear line to move. Now, Rook can also cover e8, along with the Bishop. The pawn takes the Black Rook, gets promoted to Queen. A Queen sacrifice, again! Double check and mate on display! White checks the King with the Bishop on d6 and the Rook on f1. Black cannot move his King to g8 due to the White Bishop on c4. What an ending! A great game along with a great ending makes it a worthy candidate for a brilliancy. Double Queen sacrifices and still White wins with a double mate! Relive this amazing game from the Romantic Era.